Ashley Hall is an internationally renowned trumpet soloist, chamber musician, and clinician. From small rural villages in the developing world to grand concert halls, both personally and professionally Ashley has engaged in her passion for building community and inviting people into the experience of music as a tool for connection. 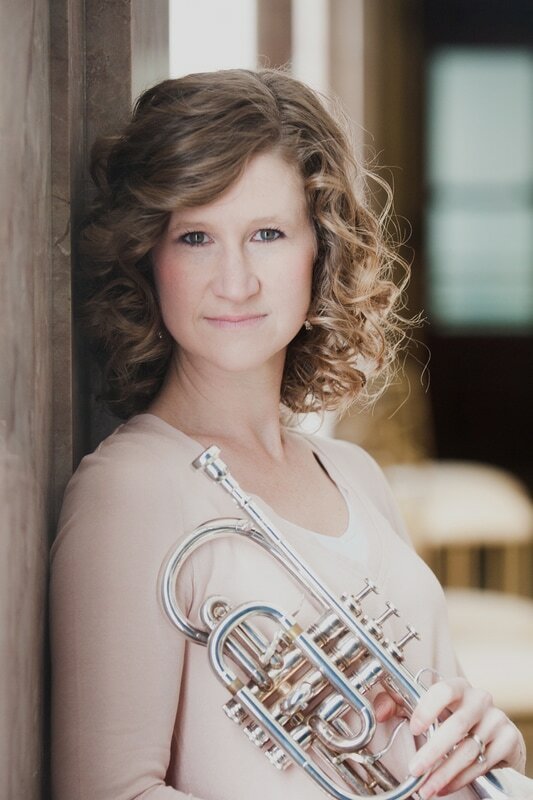 As the principal trumpet of the Cincinnati Chamber Orchestra, Ashley enjoys regular cross-discipline artistic collaborations in untraditional and traditional performance spaces in connection with their highly successful Sommermusik Festival. She also held the position of third trumpet with the Dayton Philharmonic Orchestra from 2003-2012, and has performed with the Sydney Symphony Orchestra, Cincinnati Symphony Orchestra, Charlotte Symphony, Chamber Orchestra of the Triangle, Winston-Salem Symphony, Greensboro Symphony, Asheville Symphony, New World Symphony Orchestra, and Sinfonia Gulf Coast. Her work as a soloist and recitalist has taken her around the globe including performances in Taiwan, South Korea, New Zealand, Australia, Germany, Mexico and China. Recent career highlights include solo appearances in Taipei, Taiwan with the Grace Orchestra, multiple performances of B Minor Mass, and cornet solos with the Atlantic Brass Band, North Carolina Brass Band and the Sheldon Theatre Brass Band. As Concert Master of the North Carolina Brass Band, member of Carolina Brass and associate artist with the Rodney Marsalis Philadelphia Big Brass, Mrs. Hall enjoys a busy and diverse performance calendar. Recent highlights include multiple solo recital tours, playing principal trumpet with the Chamber Orchestra of Philadelphia on the JAWS Live Concert, recording an album of Premieres with The Poijat Septet, touring with Stiletto Brass Quintet, an Asia tour with the Rodney Marsalis Philadelphia Big Brass, returning as guest artist to the Great American Brass Band Festival, and being the featured trumpet solo artist at the International Women's Brass Conference. Ashley served as the Interim Professor of Trumpet at the University of North Carolina School of the Arts from 2016-2017, and has held collegiate teaching positions at St. Olaf College and the University of Dayton. With vast experience in Arts Education, Ashley served on the board of directors for the Rochester Symphony (MN), helping the Symphony reimagine its Educational Outreach programming. In collaboration with the Dayton Arts Institute, she and her husband developed “Art and Music: Making the Connection”—an educational program helping students to see the connections between visual art and music as they evolved over time. Mrs. Hall holds a bachelor's degree in trumpet performance from the University of Cincinnati-College Conservatory of Music and an artist diploma from the Longy School of Music. When not traveling and performing, she enjoys her second career as a mother to two incredible children, Morgan and Kevin, and as a wife/best friend to Nathan Tighe. She proudly endorses GR Mouthpieces.